Amanullah Khan (Pashto, Persian, Urdu, Arabic: أمان اللہ خان ) (June 1, 1892 – April 25, 1960) was the Sovereign of Afghanistan from 1919 to 1929. He was first an Emir and after 1926 the King. He led Afghanistan to freedom from the United Kingdom. He was the first Afghan ruler to make the country more modern. Habibullah Kalakani and his followers fought against Khan. On 14 January 1929, Amanullah went to then neighboring British India. Afghanistan fell into a civil war. From British India he went to Europe where he died in Zürich, Switzerland, in 1960. 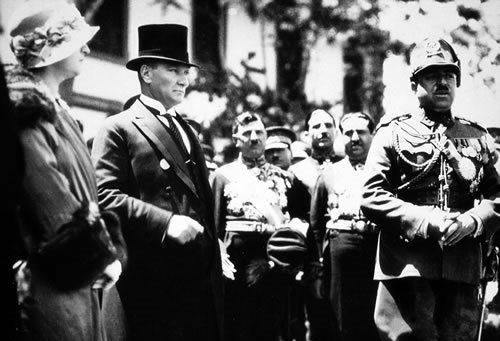 Amānullāh Khān with first Turkish President, Mustafa Kemal Atatürk in Ankara, (1928). Amānullāh Khān Facts for Kids. Kiddle Encyclopedia.